When you are going through and changing out all of your make-up, skincare and body care, it's easy to forget about certain products - one being self tanners! They are a handy option come spring when your pins are pasty-white after spending all winter covered up, but your usual self-tanner could seriously be affecting your health. Many contain at least three different parabens, PEG's, synthetic fragrance and more. Here's quick look at some of the harmful and/or toxic ingredients commonly found in self-tanners. These are the most widely used group of cosmetic preservatives. Mimic estrogen in the body and are endocrine (hormone) disruptors. Methylparabens have been found in breast tumours in some studies. A common cosmetic preservative. Endocrine (hormone) disruptor. Linked to skin irritation, contact dermatitis, also linked to adverse brain and nervous system affects in animal studies. So, what are the alternatives? I've included the top natural sunless tanners below, alongside a few bronzers/bronzing lotions. This is one of the most popular natural sunless tanners. EcoTan is Certified Organic, EcoCert and 100% natural. The EcoTan Invisible Tan is also Cruelty Free and Vegan, and they even have a Face Tan Water for your face & decollete! The EcoTan provides a natural-looking sunless tan, and is also available in a Winter Skin shade for the very fair, beginners, or as you guessed it - Winter skin! Chocolate Sun is another wonderful brand, with 87% Certified Organic ingredients, Cruelty Free and a natural DHA, this sunless tanning lotion is available in a range of shades, suited to very fair right up to dark skin tones. The Chocolate Sun sunless tanner is also available in a spray option, for those who prefer spray tanning, over lotions. The Prtty Peaushun body lotion is like airbrush for your body! It can be used over the top of a faux tan to help extend the wear, or use before a special event to help blur slight imperfections and add a gorgeous glow! Rich and moisturising, this is a great temporary alternative to a sunless tan, and contains Certified Organic ingredients and is Cruelty Free & Vegan. 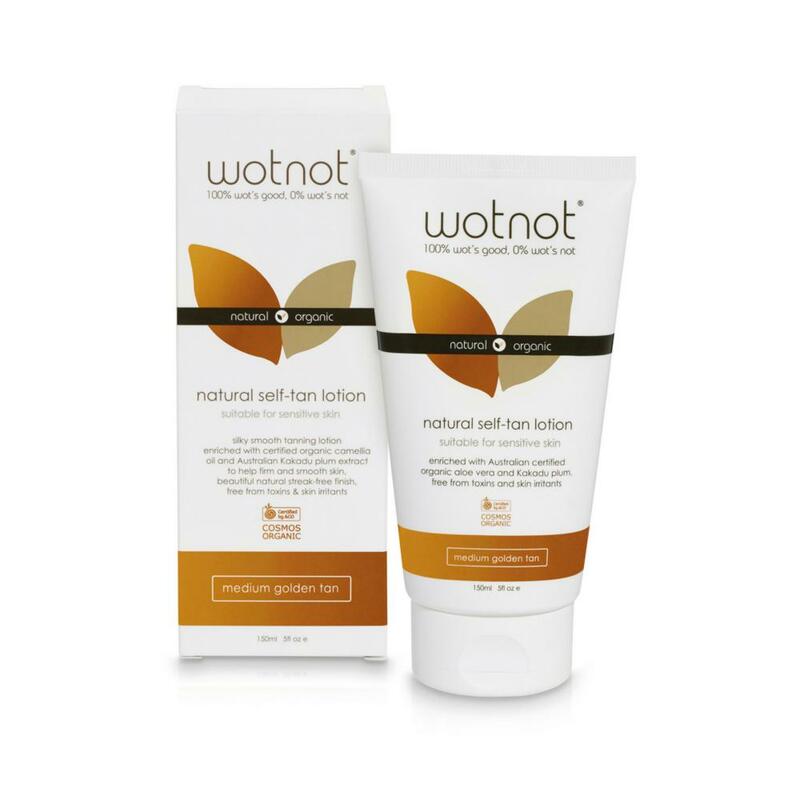 The Wotnot Tanning Lotion is an organic, self-tanning lotion, containing a velvety soft blend of organic ingredients that moisturise and nourish the skin, while developing a natural, streak-free, medium golden tan. It’s available in one shade, but the depth of colour can be adjusted depending on the amount and frequency of application. No orange-tint here!